Series Preview: Will “scuffling” Yankees spoil Boston’s aspirations for top-five draft pick? The race for a top five draft pick is on, Sox fans! Going into Tuesday night’s action, Boston’s record sat at 63-78 – four games better than Cleveland (59-81) in the pivotal “Loss” column for the fifth pick. 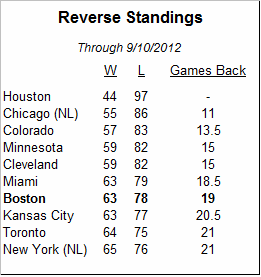 Meanwhile, the third-worst slot was also well within reach as Colorado sits at 56-83 (five losses ahead of the Sox). The faltering Red Sox (losers of nine of their last 10 games), it would seem, could be lining themselves up nicely for a top-five draft pick in the 2013 amateur player draft. But leave it to the reeling New York Yankees to come to town just in time to spoil the party. The first-place Bombers limp into town as they begin a three-game set with the Red Sox at Fenway Park on Tuesday night. The aging Yanks aren’t exactly forging ahead full throttle as they enter the season’s final weeks, which is likely to feature an eventual playoff staredown with fellow AL East contenders Baltimore and Tampa Bay. And as usual, everything the Yankees do is quite obviously aimed at weakening the Red Sox. In fact, both the manager and New York players confirmed that they will put their playoff aspirations on hold just long enough to hopefully bolster Boston’s win total and spoil their 2013 draft positioning. The Yankees manager claims he is also working on disenfranchising franchise player Derek Jeter. For his part, lame duck Sox manager Bobby Valentine does not sound worried. Asked for specifics, Valentine remained coy, but did provide one telling piece of information. A year later, as the slate of games went final on September 4, 2012, the New York Yankees’ playoff odds are projected to be just under 80% after the team fell into a tie for first place in the AL East with the Baltimore Orioles last night. Boston’s 1978 collapse was slightly less impressive in that it began earlier in the summer – yet that Red Sox team still had a playoff probability of 96.54% on August 12, according to the SI story linked above. That infamous one-game playoff was necessary in large part because the Yankees won at a near 75% clip during the final seven weeks of the season rather than Boston suffering anything close to the ineptitude of September 2011. So it is no exaggeration to suggest that both the 2011 and 1978 Red Sox absolutely dwarf this cute little bout of flatulence dressed up as a pants-shitting collapse currently fueling late-summer hysteria in the Bronx. 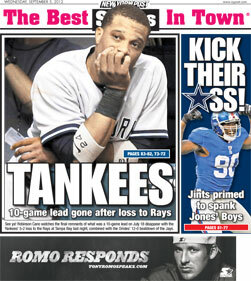 To wit: The NY Post only used something like 85-point font for their “TANKEES” headline on Wednesday morning. Are these jaded New Yorkers taking this thing seriously? Even if New York is able to continue losing and to take this downward chute all the way to the finish line, they’ll merely be an also-ran in baseball’s long history of September swoons. And it is conceivable that the Yanks could place third in the AL East behind Baltimore and Tampa Bay and still managed to sneak into the playoffs for the one-game Wild Card round. This is a laissez-faire collapse if there ever was one. Obviously, poor New York’s odd inferiority complex with Boston has reared its ugly head yet again. Sometimes we wonder why New Yorkers can’t just accept the harsh truth that Boston is so much more efficient than New York. Its collapses are grander; its players more hapless and, if 2012 is any indicator, its fallout more maddening than ever considered possible. The gravest tragedy that will come of all this? The Yankees will probably start fielding a better, healthier lineup over the last four weeks of the season, catch a few breaks and manage to somehow win the division anyway. Wait ‘til next year, indeed.